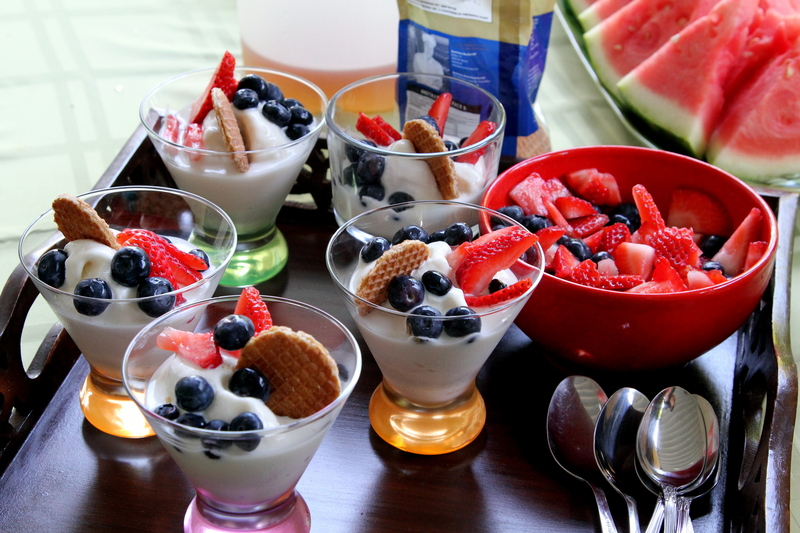 Frozen Yogurt [recipe] – Cin Cin, Let's Eat! It’s been in the high 90’s (sometimes over 100) here in the South Bay of Sunny California. Summer is finally here, a little late, and a little bit extreme. I have been avoiding turning on the stove and the oven, so please excuse my lack of updates lately. Last weekend, before this crazy heatwave hits, I held a barbecue in my backyard for Father’s day. Nothing beats cold beer, the sound and smell of meat sizzling on the grill, and the perfect 80 degree weather with a light breeze. We grilled up some of our favorites – Steak from Harris Ranch, Island chicken with grilled pineapples, bratwursts, BBQ corn, and a lot of bacon-wrapped goodies. To finish off this feast, my sister brought her ice cream maker and made delicious frozen yogurt. This all started 4 years ago when I got on the Pinkberry tart frozen yogurt train and have been on it ever since. My sister wanted to make her own version, tried a few different recipe and didn’t like any of it. She came across the recipe that came with her Cuisinart ice cream maker’s instruction pamphlet, and even though it’s not nonfat and not nearly close to the same tart flavor, we all agreed that it tastes much lighter than normal store-bought soft-serve frozen yogurt and the creamy texture and the slight tartness is pretty awesome. Turn the ice cream machine on and pour in the mixture. It will be ready around 20-25 minutes. If firmer consistency is desired, scope the frozen yogurt out to a container and then freeze it for about 2 hours before serving. (Makes fourteen 1/2 cup servings.) 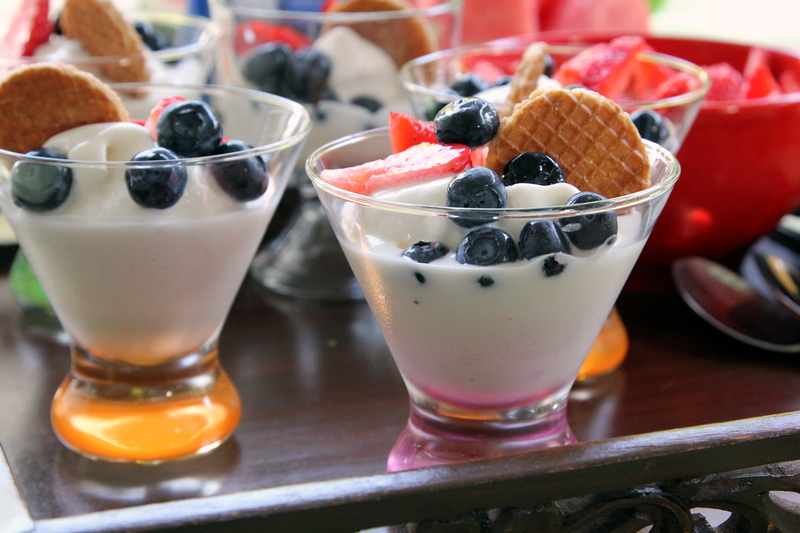 We love to serve them with berries and butter wafer cookies. ***Since we substituted and modified the ingredient list, the result is probably more liquidy compare to the original recipe, definitely require some freezing before serving. If you freeze it for too long, it’ll be frozen solid and impossible to scoop. No worries, just let it sit in room temperature for a bit, and it’ll become soft and scoopable again. Nutritional Information Per Serving from Cuisinart’s website. The modified version probably has less calories! I like those glasses. We have two that are similar, but they say Kahlua on the back, so not for company. Great photos too. I hear what you’re saying about wanting to stay out of the heat. We have air and I’m guessing in Cali you may not.